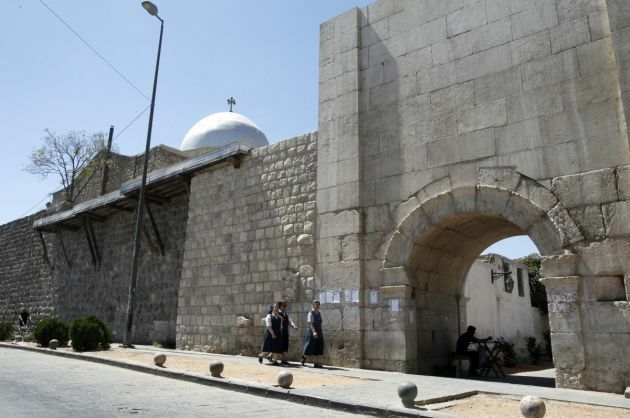 (Photo: Reuters / Khaled al-Hariri)Nuns walk as they enter the Christian quarter of Bab Sharki in Damascus September 6, 2012. Syria's Christians, who make up less than 10 percent of the 23 million population, include Greek Orthodox, Syriac Orthodox, Maronite and Melkite Greek Catholic faithful. Already thousands have left, part of a larger tide of displaced Syrians escaping the conflict Picture taken September 6, 2012. The Religious Liberty Partnership has asked the United Nations Special Envoy for Syria, Lakhdar Brahimi, to pay particular attention to "vulnerable ethnic and religious minorities" in war-torn Syria. Called the Istanbul Statement on the Church in Syria, it expresses concern about the exodus of Christians and other ethnic and religious minorities from Syria. The RLP, a grouping of mainly evangelical church organizations, in its statement calls on the international community to "provide sufficient protection for all ethnic and religious communities as well as their historical, religious, and cultural sites." It joins the Roman Catholic Church and global ecumenical organizations that have recently expressed concern for the plight of religious minorities in Syria. "There was overwhelming support at our 2013 Consultation in Istanbul to speak out about the urgent situation facing Christians and other religious minorities in Syria at this present time," said Mervyn Thomas. chairman of the RLP, and CEO of Christian Solidarity Worldwide, UK. "We urge Christian leaders around the world to respond to this call to prayer and action now in order to bring peace and stability to this troubled nation." The statement was drafted during the annual gathering of RLP organizations held in Istanbul in late March. The Religious Liberty Partnership commits "to raise awareness and work toward a peaceful solution of the current crisis, including reconciliation among the various ethnic and religious communities." It also says it will "to utilize practices that prioritize the well-being of all Syrians when providing assistance and advocating on behalf of the vulnerable."